Fig (Ficus spp.) trees, shrubs and vines thrive in Mediterranean and other climates around the world. Many of the 2,000 species produce edible figs, but the common fig (Ficus carica) with varieties such as “Black Jack,” which grows in U.S. Department of Agriculture plant hardiness zones 7 through 9, is grown for its fruit. Fig tree wood is typically weak and can rot quickly, so fertilizing and pruning encourages strong limbs and roots, whether or not the plant bears fruit. Unless they're grown inside or in outdoor containers, fig trees and shrubs usually do not need constant feeding. In general, fertilize outdoor plants if shoots grew only 1 1/2 feet or less the previous year. Fertilizing fig trees with nitrogen encourages shoots and greenery, but too many chemicals may cause stunted fruits that won’t ripen. For trees up to 10 years old, apply 1 pound of 8-8-8 fertilizer for each year of the tree's age, with a maximum of 10 pounds per year, advises Louisiana State University Extension. Trees more than 10 years old should have a total of 10 pounds a year. Divide the amount of fertilizer over three or four applications during late winter or early spring but no later than early July. Figs growing in sandy soil need consistent fertilizing. Fig stems can be trained into bushes or trees but in some areas of USDA zones 8 through 10, the plants may freeze to the ground during dormancy, making it difficult to maintain them as trees. For bush training, cut it about halfway down so that shoots and stems grow from the base. As shoots grow upward throughout the first season, choose three to eight well-spaced, strong stems and remove the rest, advises Alabama Cooperative Extension. The shoots must have ample room to grow, spread and thicken. Trim the shoots back to 1 foot above the ground. After danger of frost has passed in the second year, remove about one-third to one-half of the new growth and any dead wood or tangled branches growing around leading stems. Clip low-growing branches and suckers at branches or buds. Depending on how much room you have in your yard, you can train fig plants to grow as trees, either by themselves or in orchards. Space multiple trees at least 20 feet apart. Fig trees do not need heavy pruning as they mature but training them in the first three seasons helps to develop the shape and keeps trunks from dividing. Pruning fig trees into modified central leader shapes discourages insects while protecting the trunk bark from burning in hot sun. In the first year, you can summer prune and remove offshoots when new stems are about 4 inches long to create a central trunk. In subsequent seasons, trim unwanted shoots and dead branches at crotch angles. Space out expanding side branches equally around the center trunk. Fig trees and shrubs growing outdoors prefer hot, dry summers but many grow in climates with temperatures that fall to 15 or 20 degrees Fahrenheit if the plants are protected from frost. 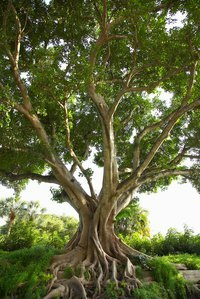 Fig trees thrive in a variety of deep, well-draining soils -- limestone, loam, sand, clay -- with pH of 6.0 to 6.5. To develop deep root systems, plant fig trees during winter dormancy. In the first season, new stems develop expanding roots and thickening trunks. Branches and limbs thicken during the tree’s second and third seasons as trunk bark spreads and leaves grow. Fruiting trees usually take several years before they produce figs. Fig trees may yield two harvests yearly: the breba crop, which comes from the previous season’s wood and the main crop that develops from new growth. Main crops usually ripen from August through November, depending on climate and the tree variety, but trees growing in USDA zones 8 through 10 or other Mediterranean climates may not produce sweetened figs if exposed to prolonged cold temperatures. When pruning, you can trim fruit-bearing trees after the final harvest of the season. When Do Fig Trees Bloom?